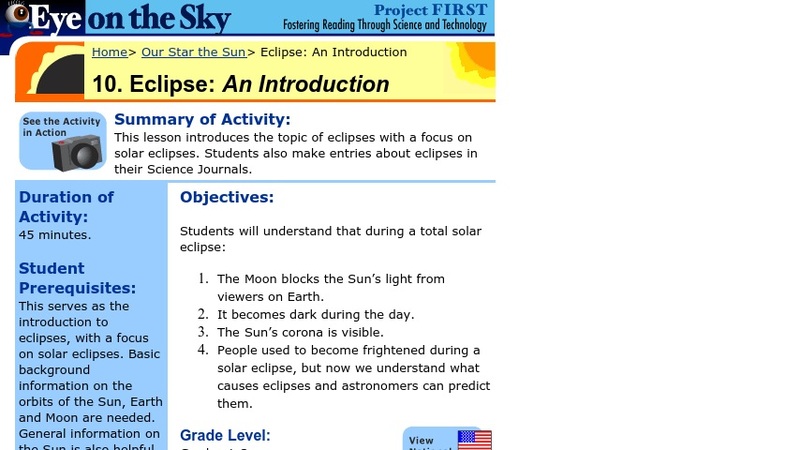 This is an activity introducing the topic of eclipses with a focus on solar eclipses. Learners will first identify what they already know about eclipses. They will also vocalize any questions they may have concerning eclipses. Next, a book is read out loud in class and students are asked to identify related vocabulary words for a Science Reading Wall as well as determine if any answers have been found for their initial questions. Lastly, learners will complete journal prompts to better identify concepts learned. This activity will require the acquisition of one of two listed books. This is Activity 10 of a larger resource, entitled Eye on the Sky.